The Game Changers #7. Met een portret van componist Tamás Ungváry. Tamás Ungváry. Born in Kalocsa, Hungary, 1936. Studied double bass at the Béla Bartók Concervatory, Budapest. Member of the Hungarian State Philharmonic Orchestra, 1957-67. Studied conducting under Dean Dixon, Jean Martinon, Albert Simon and Gerhard Wimberger at Mozarteum, Salzburg; diploma 1969. Composition studies on the Darmstadt new music couses, under György Ligeti and Iannis Xenakis. Came to Sweden in 1969, at first continuing his conducting career. Winner in 1971 of the International Young Conductors’competition in Florence and of the national competition in Gävle. Worked between 1974 and 1992 at the Electro-Acoustic Music Foundation (EMS) in Sweden, where in addition to teaching duties he was in charge of computer music production and software development. Founder in 1986 of the Kinero-Auditory Communications Research Group, which he heads at the Department of Speech Communication and Music Acoustics, Royal Institute of Technology. Since 1991 in charge of the electro-acoustic and computer music courses at the Hochschule für Music und Darstellende Kunst, Vienna.Ungváry has served on the committee of the International Computer Music Association. His research activities and co-opereation with various European universities are described in several publications. 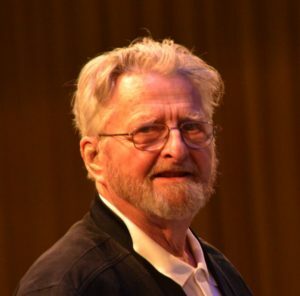 His music has been frequently played at Nordic and international festivals since 1972. Senttograffito was selected for the 1994 Nordic Music Days. Ungváry’s production Real-Time won the second prize in the 1994 Ars Electronica. Ungvary, an important and much-too-neglected composer, contributes his work “L’aube des flammes “(1984) to this collection. Although Mr. Ungvary has prided himself on the development of his own software, I nearly always find his work transcends technique and technology. Always imaginative, sometimes harsh, frightening, and even monstrous, Tamás Ungváry is the Franz Liszt of electroacoustic music. SOLO for the dancer/choreografer Peter Rajka. 4. SEUL – Tamás Ungváry, 1972. Electroacoustic music for twentyfour computer controlled soundgenerators. composed at EMS Stockholm. The title SEUL (Alone , Ensam, Einsam, Egyedül) indicates the meditative character of the music. It has been my every first composition of computermusic, premiered in Reykjavik (Island) at the ISCM World Music Festival 1973. ***** commissioned by the Swedish Radio 2007.